William F. R. Anderson P.M., Lodge St. John No.16 Falkirk. Brother William was presented with his 50 Years Jubilee Certificate at the Regular Meeting held in Lodge St. John No. 16 on Tuesday 14th September 2010. 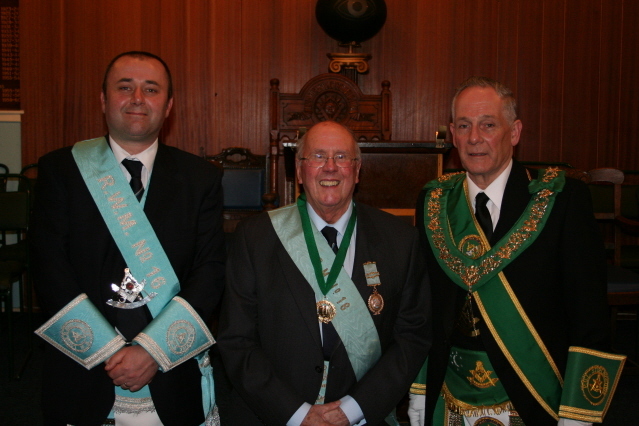 The presentation was made by Brother Allan T. Leishman R.W.M. in the presence of the R.W.P.G.M. Brother Andrew A. McKinnon. Brother Bill was initiated on 12th January 1960 and served as Master of his Lodge for two years from December 1973 until December 1975. He later went on to become Almoner of his Lodge for a period of nineteen years. In recognition of his services to his Lodge the Most Worshipful Grand Master Mason conferred upon him the Honorary Grand Rank of Bible Bearer in 1998. Brother Anderson served more than forty years in continuous Office in Lodge St. John No. 16 and is still a regular attendee.